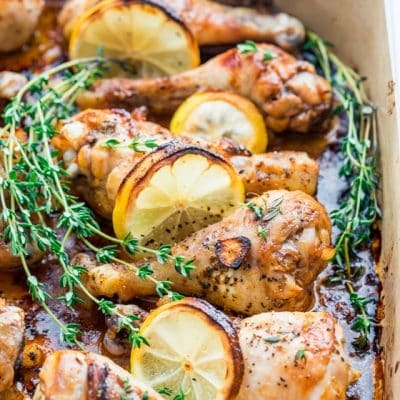 These lemon garlic roasted chicken legs are loaded with flavors, perfect for a super quick dinner which includes a really fast prep, no bowls to wash, and only ONE pan! Even when it’s 102 degrees outside, I will still turn on my oven to roast some meat or bake a cake. That’s just the kind of gal I am. I’d rather suffer through the heat and enjoy a good meal, a delicious cake, warm bread, or even these delicious roasted chicken legs. Of course you can always grill them but I find that standing over a grill in the sun, is even hotter than just turning my oven on, then I can sit comfortably in an air conditioned house. There’s always logic to my madness, just trust in me. But why chicken legs, you ask. Why not, I say. They’re delicious, they’re portable which is great if you’re having a picnic, or are asked to bring something to a potluck, plus you can also eat them cold. Seriously, what more do you want? Of course, who am I to say that you cannot use chicken thighs, or chicken breast, any cuts of chicken will actually work for this recipe, just check the recipe notes for instructions. What I love about this recipe is its simplicity. You do it all in a ziploc bag, no bowls to wash, just one pan, which in my book is huge. Washing dishes, not my thing. You basically add all these ingredients to a ziploc bag, close it up, then shake shake shake. I do specify to marinate this for minimum of 30 minutes, though you know my stance on marinating meat. Supposedly it doesn’t really work, but not to worry. There’s plenty of flavor here. The other great thing is that you really could prep this the night before, place the ziploc bag in the fridge, then when you come home the next day from work, just dump the contents into a pan, place it in the oven and 30 minutes later you’ve got dinner. Well at least the protein for your dinner. You could, of course, pick up some salad on your way home from work but I have included some sides in the recipe notes that you can serve these legs with. And that’s all she wrote. Go on and print that recipe, you know you want to. In a large ziploc bag add the chicken legs, melted butter, olive oil, oregano, paprika, garlic, lemon juice, salt and pepper. Close the ziploc bag and toss everything together well. Place the ziploc bag in the fridge and marinate for a minimum of 30 minutes up to 24 hours. Preheat the oven to 450 F degrees. 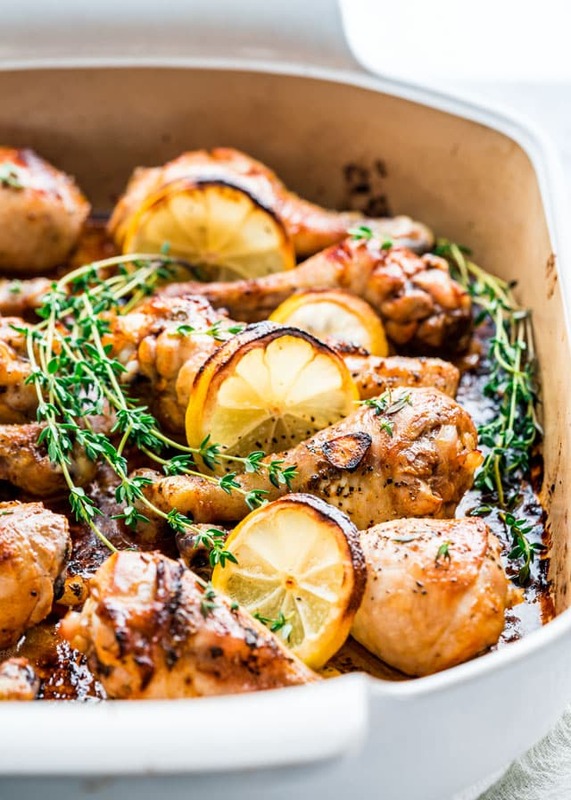 Transfer the chicken legs to a large casserole dish and place the lemon slices in between the legs. Bake uncovered for 30 to 35 minutes or until legs are golden brown and cooked through. Garnish with fresh thyme and serve warm. To ensure your chicken is cooked through, the best way is to use a thermometer. A thermometer inserted in the middle of the drumstick should read 180 to 185 degrees. If you don't have a thermometer, another way to ensure your chicken is cooked is to pierce it with a knife and if the juices that run out are clear, your chicken should be cooked. 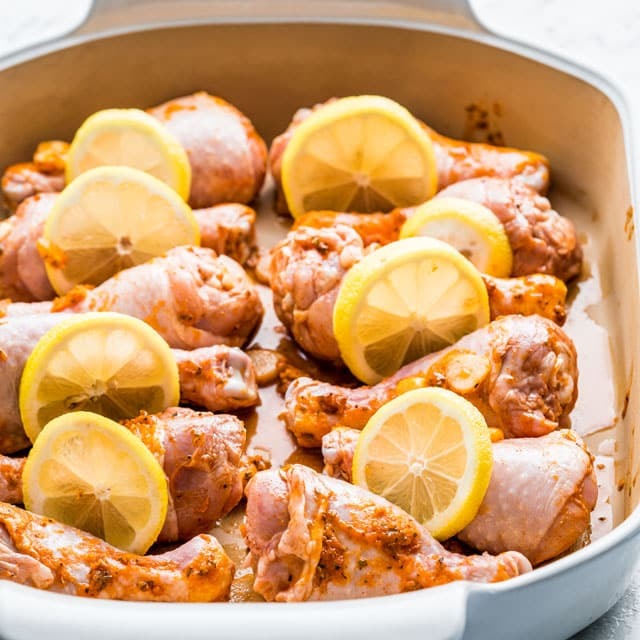 Chicken thighs either boneless and skinless or with skin and bones can also be used though they might require 5 or 10 extra minutes to cook. Use the above mentioned methods for checking for doneness. Chicken breast can also be used, but the cooking time could vary based on size of breast. Serve these along with salads, rice, mashed potatoes, roasted potatoes, coleslaw, etc. Total time includes time to marinade the chicken. 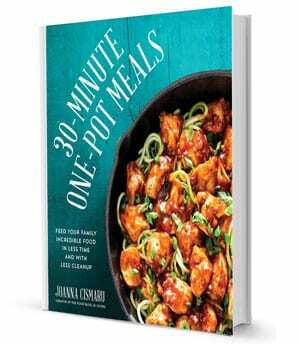 Hi Jo, I am planning on making this soon. I only have bone in 2 legs and 3 thighs in the freezer, that is what I am going to use. I am wondering do I need to make a cooking time adjustment? 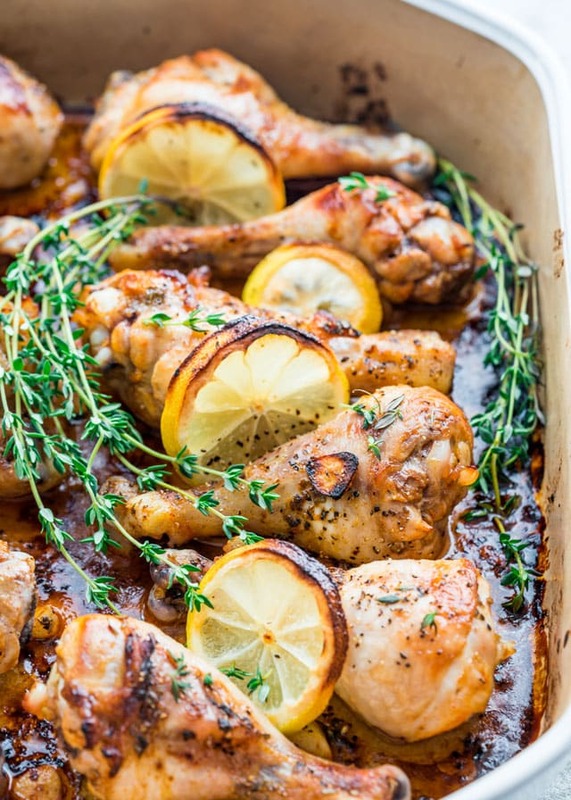 I am always looking for new ways to cook chicken and this recipe looks delish, thank you in advance for your reply. No, the time should still be fine, however if your thighs are bigger they might require a few extra minutes. Can you use rosemary instead of thyme? Hello. Everytime i have used sliced lemons in a recipe the dish becomes bitter. Any suggestions on how to avoid that? You can just squeeze some lemon juice over them instead. 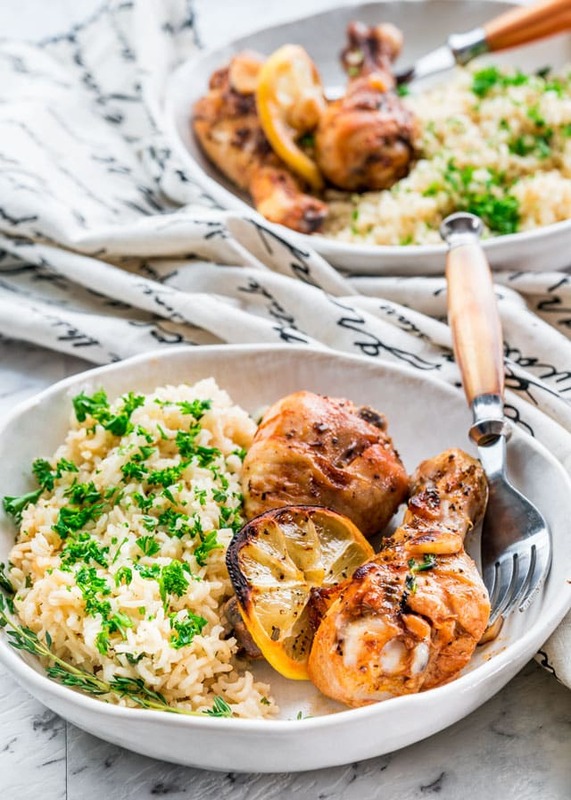 I am a lover of ALL THINGS LEMON and make a mean chicken oregano dish myself. BUT FOLKS, this recipe was fabulous. Loved it and so did everyone at the table. The roasted paprika adds that extra touch. I used chicken thighs and YUMMMMM-MY! You’ll definitely want to scoop up the tasty juices from the pan! This has become one of our favorite dishes! 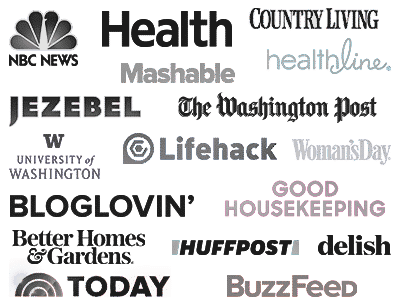 I sometimes just cook chicken breasts with these flavors in a pan and serve it with salad – yummy! Thank you so much, dear Jo! My pleasure, glad to hear you like it! This Recipe looks so yummy!! !…Thanks for the recipe. Hi Kathleen! Usually stir fries are usually best served right away but they can still be refrigerated in airtight containers and heated up prior to serving them. I always love to try new recipe for Chicken. This recipe looks yummy and will try soon. Thanks for sharing. 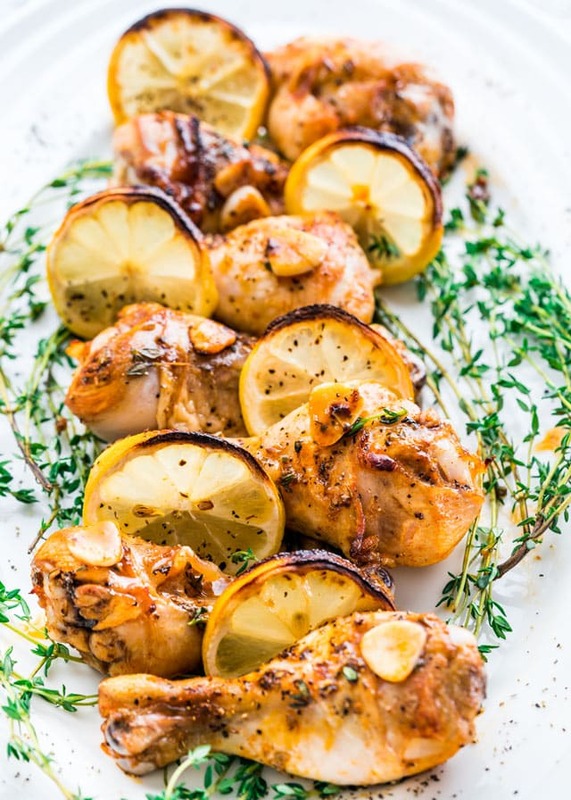 Your Lemon Garlic Roasted Chicken Legs looks very flavorful. I will surely try this delicious recipe very soon. Thanks for sharing. Hi Jo. This sounds delicious! Chicken is one of the proteins that is still reasonably priced. I buy thighs mostly. Occasionally I will buy a whole chicken to roast and I always put lemon and rosemary in the cavity and lots of garlic, salt and pepper on the outside. Nothing like juicy chicken with nice crispy skin. With a/c I don’t hesitate to turn on the oven.